The New York Police Department charged a man with second-degree murder in the death last August of a jogger in Queens, Detective Ahmed Nasser said. Investigators looked at arrests, calls to police and summonses. A 911 call about a suspicious person made back in May led police to look into Chanel Lewis, 20, of Brooklyn. He is charged with killing Karina Vetrano, 30, in a chance encounter on August 2 as she was out running alone on a park trail near her Howard Beach home. Police said Lewis and Vetrano did not know each other. CNN has reached out to Lewis’ attorneys, Julia Burke and Robert Moeller. They were not immediately available for comment. At a press conference Monday, Mayor Bill De Blasio praised Detective Robert Boyce and his team for their work on the case and thanked the community for its support. “Karina helped us identify this person,” Boyce said, referring to the DNA found under her nails, on her back and on her cell phone. Vetrano’s body was found by police and her father. She had been strangled and sexually assaulted. Lewis does not have a criminal arrest history, but has a number of summonses in and around the area. He made detailed incriminating statements, Boyce said. Police also believe there is only one suspect in this case. “Everything we have revolves around one person. We only have one DNA profile from that case and that’s him,” Boyce said Monday. The news of the arrest brought some solace to Vetrano’s parents, who marked the six-month anniversary of their daughter’s death on Thursday. “I’m not going to say it’s a good day but we can move forward now … We’re at a place we were never at. We know who did this,” Phil Vetrano told CNN affiliate WCBS on Sunday in an interview outside the family’s home. But she praised the NYPD. “They worked endlessly and tirelessly and that was because of their passion combined with our passion for our daughter,” she said. “He’s a savage and I’m glad that he’s off the street so that he doesn’t kill anyone else’s daughter,” Cathy Vetrano added. The suspect faces up to 25 years to life in prison, if convicted. 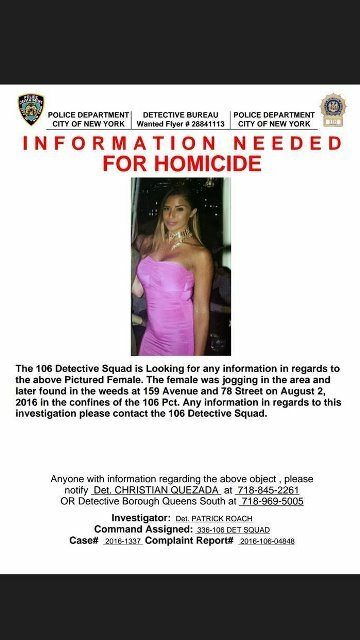 “This is truly a very sad case in which a beautiful and talented young woman senselessly lost her life,” Queens District Attorney Richard A. Brown said in a statement. The NYPD had developed a DNA profile of Vetrano’s killer almost immediately using material collected from her cell phone and her body — but they ran up against a roadblock, CNN affiliate WABC reported. “We put that into our database, and there was no nationwide hit on it or any state hit on it,” Boyce said at the time. Vetrano’s father said Sunday he will continue to urge the state to allow familial DNA testing, which would enable investigators to identify people in the state DNA database who are related to an unknown suspect, WABC reported. Lewis is being held at the Manhattan House of Detention. He is expected in Queens Criminal Court on February 21.